A few months ago I published a collection of eCommerce HTML templates made with Bootstrap to use if you want to create a new online shop for yourself or your clients. Today we’re going to take a look at the same type of themes, but this time, for WordPress. As usual they come with many features and ready-to-use components to help you save some time building your next eCommerce website. 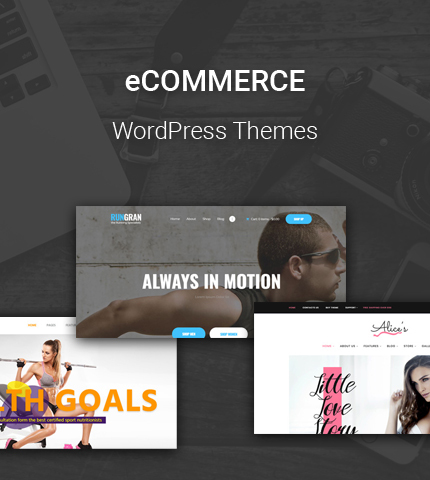 Coleo by ThemeREX is a theme built specifically for those looking to become an online fashion retailer. It comes with numerous pre-designed pages, which will reduce time and effort on your part, while still giving your eCommerce WordPress store a modern and user-friendly appearance. 100% Responsive and also Retina Ready, this theme is accessible on all digital platforms in its original high quality view. Coleo is compatible with different plugins, such as Slider Revolution, Essential Grid, WPBakery Page Builder and many more. All of these make it possible for you to create and customize layouts according to how you want your online store to work and look. For users that are new to creating a website from scratch, Coleo comes with One-click Demo installation so that everything can be set up in just a few minutes. This is customizable by you, too. The Admin Interface is powerful and with plenty of options, it comes with a customizable Google Map and it is also Translation Ready. There are post animations available, custom shortcodes and of course, detailed documentation and professional support, should you need it. 69 Clothing, as the name suggests, is a theme targeted at online clothing stores. However, this is not to say that you cannot customize and modify it to fit your specific e-Commerce business. It is by Axiom Themes and it is packed with many features. There are several pre-designed pages, so you can quickly get things running, while also including gallery options, news and posts. The Store pages are made to be separate, for a more functional and appealing display. It is compatible with numerous plugins, such as WPBakery Page Builder, Essential Grid, Instagram feed, etc., which will help you create and design specific pages. The installation process is quite easy due to the One-Click Demo. Run Gran is also by ThemeREX, designed for online stores that are sports-related. By using this theme, not only will you be able to set up shop online, but you can customize and turn into it a blog, too, along with your store. This way you can easily include tips for a healthy life, write your thoughts and become a lifestyle coach. It is compatible with WPBakery, which helps you create new pages and customize your website by using the Drag and Drop feature. The installation is easily done with the Once-click Demo, which also allows you to change any text or add and remove images during the process. There is also the ThemeREX Addons plugin that makes managing the website very simple. The Header and Footer builder is also available with the plugin. It is Retina Ready and 100% Responsive, optimized for mobile device display so that users can access your store from anywhere, at anytime. Porto by P-themes is a powerful and very fast WooCommerce theme, which comes with more than 20 pre-made Demos. It is a customizable theme that can be used for any online business you can think of. There are unlimited Header options and several Layout versions, Sidebars, Sliders, Category pages, etc. It is a SEO friendly theme, which has been optimized for speed and comes with well-organized code, should you want to work with it yourself. There are unlimited Colors & Skins and it also comes with CSS3 Animations. It has RTL support and it’s also Retina Ready and 100% Responsive, optimized for mobile display. Another theme by Axiom Themes, Welldone is created for sports sites. With it you can set up your online lifestyle and health coach website and also use it for sales of different products, such as sports gear and supplements. It is compatible with Visual Composer (WPBakery), comes with options for creating Video Sliders and the Demo layouts will help you get started in a few minutes. These Demo installations come with pre-defined layouts, which include different styles, both static and with sliders. Sticky Menus are also supported, for better navigation. It also comes with Multi Language support and a powerful Framework that includes Shortcode builder, Media Content Manager, along with different plugins such as Essential Grid and PO Composer. For fashionistas looking to start their very own online store, Alice’s is an elegant theme by ThemeREX. It comes with numerous pre-designed pages, all of which are easy to customize. If you would like something a little different, then Visual Composer will help you create whatever you want just by using its Drag & Drop feature. Best of all, you don’t need to know a single line of code to create a beautiful and successful online store. It is SEO optimized also and comes with options for Mega Menu and Sticky Menus, as well as Multi Language support. There are a lot of fonts included and an extensive color palette so that you can customize it to the finest details. Jewelry & Watches by ThemeREX is a premium quality theme that is designed specifically for jewelry online stores. You can use it to sell watches, bijous or customize it to fit your project and create any online store you want. It comes with 7 unique Homepages and numerous plugins such as WPBakery, Essential Grid, MailChimp, Instagram Feed, Slider Revolution, etc., all of which make it easier to create, customize and manage your site. It is a Fully Responsive theme, optimized for mobile devices, on which you can view products by swiping, made possible by Slider Revolution. There are also Parallax Effect backgrounds for creating a site that is stunning and elegant. If you would like to become an online retailer of musical instruments and want to do so in the quickest and simplest way, Sound is just the theme for you. Designed by ThemeREX, it comes with 3 demo installations, loaded with pre-designed pages and numerous plugins that you can make use of to customize and manage your online business. These plugins include Visual Composer, Essential Grid, Slider Revolution, Instagram Feed, MailChimp and many more. It comes with built-in Mega Menu, it is SEO optimized and comes with rich admin features, along with Sitcky Menu support and the Back-to-top button for better navigation.